Two good books, by two proven prophets, about the current move of God. 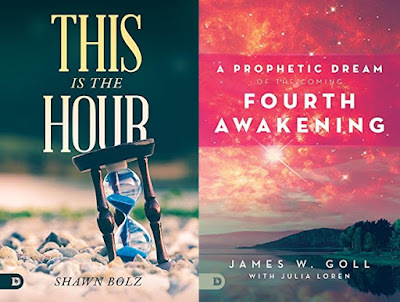 Shawn Bolz is a young prophet. He has been a pioneer in ministry, including the prophetic movement, since he was in his teens. His focus on having a genuine relationship with God, creativity through entertainment & social justice have brought him around the world to meet with churches, CEO's, entertainers, and world leaders. 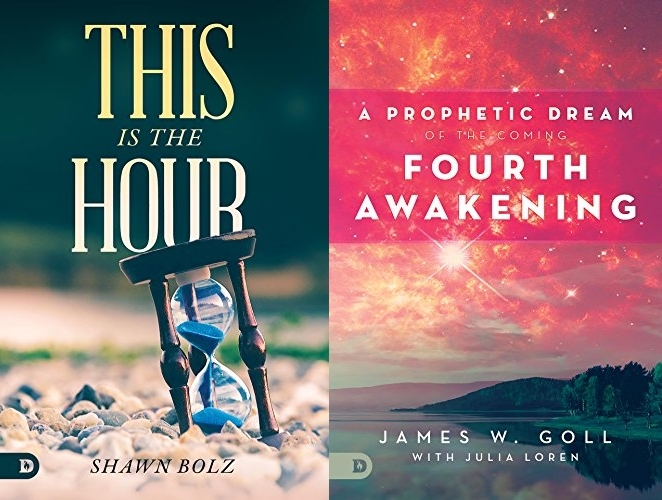 Shawn’s book, This Is the Hour, describes how God is doing something amazing in this generation. The signs that this a generation prophesied to shake the foundations of the Earth are all around us, for this willing to listen. This is the generation that God is raising up right now—a people that will stand for truth and the Gospel, and not compromise with the things of the world. James Goll has been in prophetic ministry for decades. James (Jim) is a member of the Harvest International Ministries Apostolic Team, the Apostolic Council of Prophetic Elders, and other national and international ministries. Jim’s book is called A Prophetic Dream of the Coming FourthAwakening. Like an eagle in flight, I was hovering over the globe in search for a place to land. Throughout the Bible, God uses dreams and visions to speak to believers and unbelievers alike.